Text messaging while driving on public roads and highways in Alabama could be banned under a plan that won final legislative approval on Thursday, April 26, 2012. House Bill 2 now sits on the Governor Robert Bentley’s desk. The bill bans anyone from operating a vehicle on a public road or highway while manually using a cell phone or other wireless device to communicate by text message, instant message or email. 3) a driver in a motor vehicle parked on the shoulder of a road or highway. The Acts effective date will be July 1 or August 1 depending on the date the Governor signs it. 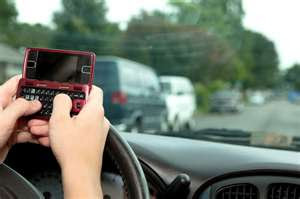 Drivers who are caught sending or writing text messages while driving will be subject to a $25 fine upon conviction. A second offense would bring a $50 fine, with all subsequent convictions carrying $75 fines. In all cases, the guilty driver convicted would also be responsible for paying any court costs. The bill has no language regarding jail time or probation attached to conviction, but does include a provision attaching a point to a driver's Alabama license in the event of conviction. As a driver your license can be pulled if you accumulate 12 points. Thirty-seven states already ban text messaging for all drivers, as has the federal government for all its employees and DOT regulated truck drivers. Employees cannot use wireless communications device to text message, instant message or email when driving on Company business. Drivers who need to use a wireless communications device to do such purpose must pull over to a safe location and stop before using the device. An employee found in violation of this policy is subject to discipline, up to and including discharge. Failing to take such preventative steps now can make you an easy litigation target when your employee is involved in a serious rear end accident while texting and you are the one accused of negligence.